OPICO is launching a re-design of its popular Sward-Lifter grassland subsoiler at LAMMA 2019. The frame has been strengthened making it even more robust than its predecessor. 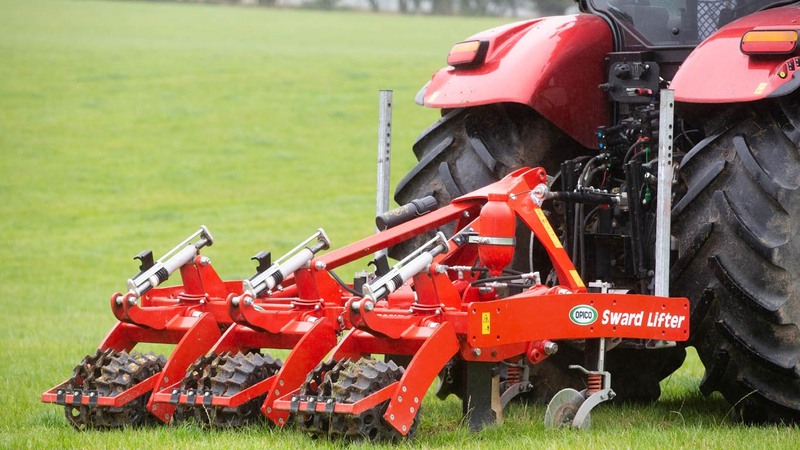 Most importantly, the cutting disc – which opens the sward in front of the subsoiler leg – is now mounted on a spring-loaded trailing arm, enabling it to trip out of the way of obstacles more easily and protect the machine from damage. The new design is available with shearbolt or hydraulic auto reset leg protection. Other features remain the same: a reversible shin to protect the leg from wear, and individual spring-loaded rollers which follow each of the subsoiler legs to close the slots and level the surface. The new design OPICO Sward-lifters are available in three working widths: 2.7m (3-leg), 3.0m (5-leg) and 4.5m (hydraulic-folding, 5-leg). Sward-Lifters with shearbolt protection retail from £7,445 +VAT and hydraulic auto reset leg protection models from £10,697 +VAT.